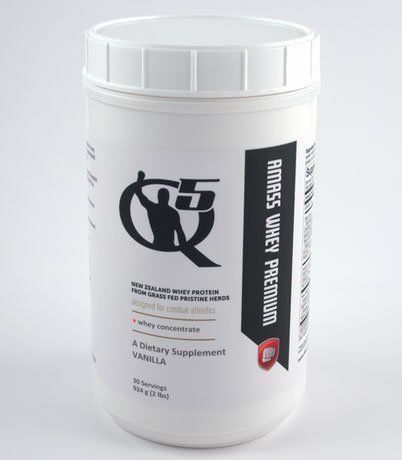 Combat Athletes – Build Lean Muscle, Recover Quicker, and Improve Energy Levels with Pure, Natural Whey Protein. How many hours have you spent sweating and grinding in the gym, working to push your body to the next level? Sparring, lifting, plyometrics, cardio work, it all puts a huge stress on your system. Your body is working overtime just trying to keep up with repairs, and if you don’t get enough of the right nutrients you’re going to crash. The older you are and the longer you’ve been training the more vital it is to feed your machine with high octane, high value foods. Just eating more isn’t an option, if you get fat or build too much bulky muscle mass you won’t fight better, you’ll just get your clock cleaned in a heavier weight class. Amass Whey Premium can help you build and maintain lean muscle and effective strength, and keep you at the right weight class. Not only that, but you’ll recover quicker from training and lifting sessions, and be less sore the next day thanks the the high levels of naturally occurring glutamine. The almost perfect composition of our grass fed New Zealand whey is extremely bio-available, making it easy for your body to quickly put those nutrients to work, making you stronger, faster, and leaner. I know you ve tried lots of protein mixes, so have I. My favorite used to be the red jug at Cheap-Mart. If I was there for something else I d grab a tub for $26 and call it good. That’s why we source 100% of our whey from New Zealand, home to some of the purest dairy production facilities in the world. New Zealand has strict laws in place to protect the quality of both the dairy products and the health and welfare of the animals. Growth hormones for cows like rGBH are completely outlawed, same with antibiotics. New Zealand cows are all grass fed and graze in pastures planted with rye grass and white clover, they are never fed grain. Even the pastures are naturally managed; they don t use any herbicides or pesticides. And all dairy products are screened by the New Zealand Ministry of Agriculture and Forestry to insure they are free of any kind of chemical contaminants. And it’s not just the accidental contamination you need to worry about, some of the ingredients companies put into whey supplements on purpose are just plain crazy. One of the biggest brands out there has the stones to add in the heavenly trio of sunflower oil, coffee creamer, and high fructose corn syrup and call it a sunflower supplement . You can t make this stuff up! 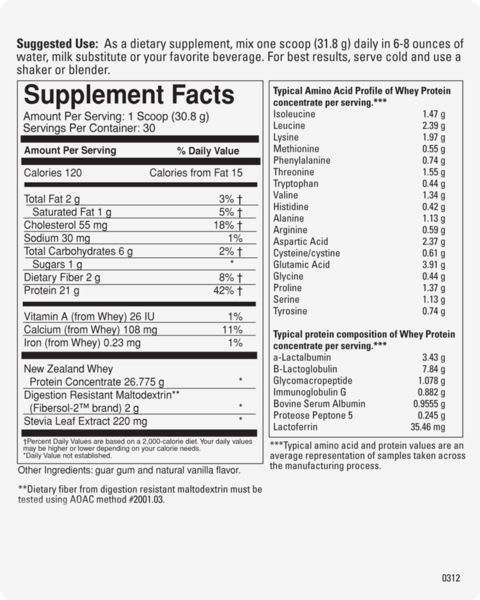 Amass Whey Premium is clean and pure with only 5 ingredients that you can actually understand. It tastes amazing, and delivers 21 grams of highly bio-available protein per serving. With only 120 calories and barely a single gram of sugar you ll be getting everything your body needs and nothing it doesn t.